The Most Rev. 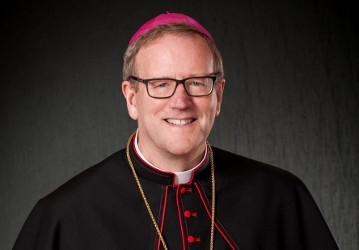 Robert Barron, Auxiliary Bishop of Los Angeles, has accepted President Michael F. McLean’s invitation to serve as Thomas Aquinas College’s 2019 Commencement Speaker. Bishop Barron is best known as the founder of the Word on Fire media ministry, which has produced hundreds of YouTube videos, garnering some 35 million views worldwide. In addition to publishing numerous books, essays, and articles on theology and the spiritual life, he has produced and hosted several award-winning documentary series, including Catholicism, Catholicism: The Pivotal Players, and The Mass. In light of his success as a teacher of the Faith, his brother bishops elected him in 2017 to chair the U.S. Conference of Catholic Bishops’ Committee on Evangelization and Catechesis. A devoted disciple of St. Thomas Aquinas, Bishop Barron received a master’s degree in philosophy from the Catholic University of America in 1982. After his ordination to the priesthood for the Archdiocese of Chicago in 1986, he served for three years as associate pastor at St. Paul of the Cross Parish in Park Ridge, Illinois. In 1992 he earned a Doctorate in Sacred Theology from the Institut Catholique de Paris. He then joined the theological faculty of Mundelein Seminary, where he served as rector from 2012 until his appointment to the episcopacy in 2015. His Excellency has also served as a visiting professor at the University of Notre Dame (2002) and the Pontifical University of St. Thomas Aquinas (2007), as well as Scholar in Residence at the Pontifical North American College (2007 and 2010). At Commencement, His Excellency will serve as the principal celebrant and homilist at the morning’s Baccalaureate Mass, then deliver the Commencement Address at the graduation ceremony for the members of the Class of 2019, who hail from across the United States and abroad. Having completed the College’s rigorous, four-year curriculum — which includes mathematics, natural science, language, literature, philosophy, and theology — each graduate will receive a Bachelor of Arts degree in liberal arts. These new alumni will go on to a wide variety of pursuits, including law, medicine, business, military service, education, public policy, and journalism, as well as the priesthood and religious life.